On a recent trip to New York with a friend who has never been, I participated in a nearly full day's walking tour of everything to immerse myself into the history of the area as well as sate the need of my friend to see what the Big Apple was all about. On this tour, our lunch break ended up being in Greenwich Village so we went off to explore what was around. Masala Times was nearby and because of the chilly day, we were completely ready for some Indian food. Upon first walking in and seeing both the bright colors and the cheeky signage, we knew we were in the right spot for lunch. The menu was divided up into several different sections - "From the Grill," "From the Pan, " "Rolls/Wraps," "Biryanis," and "Curry Boxes" - all with different accompaniments but mostly provided with salad, rice and/or daal, and paratha. The dishes were granted some thematic names to flow along withe Bollywood style so my order From the Grill was their Paneer Tikka ($10.99) also known as Hot Secret. I'm not entirely sure why though as it was hardly spicy. There was some heat on the large pieces of paneer as part of the seasoning but overall it was a mild dish. I did enjoy how large the paneer blocks were and how smoky they tasted after having been grilled. The rice was pleasantly fluffy as well. I was slightly disappointed in the mint chutney that came along with the plate however as it was watery and not as poignant in taste as other places' sauces are. 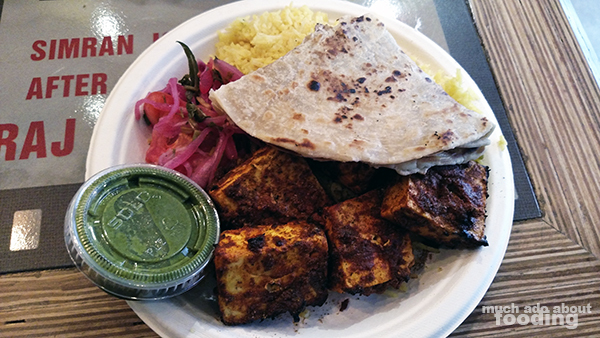 Luckily, the paneer didn't need it much as it was well covered by its own spice mix. To give you an idea of some other dish names, there were also plates called Debutante, Tender Love, and Fishy Dreams; creative, right? My friend opted for a curry box himself because he wanted the warm comforts of tasty curry. These came with salad, daal, rice, and paratha. His choice? 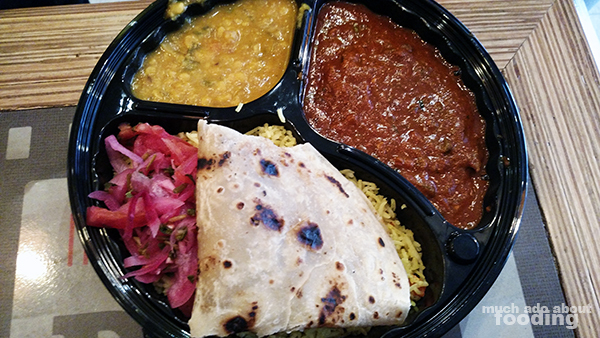 The Lamb Box ($13.95 - choice of lamb bhuna, lamb saag, and lamb vindaloo) for which he went with the vindaloo for some heat. I tasted them and the vindaloo had quite the pleasurable kick to it but a little lacking in the rich boldness of flavors typical to Indian food. Perhaps it was hidden under the heat. The daal after that was especially mild and slightly watery. He also tried out their Mango Lassi ($3.50) which I didn't taste but he claimed it was good; I instead went for a cup of Masala Chai ($2.50) but was disappointed at the scant quantity that came for that price as well as the lack of depth in the tea itself. Overall, the restaurant gave a good offering to scratch the itch we had for some Indian food but to really cure the itch, I think I'd need to find another spot with more oomph to each bite.